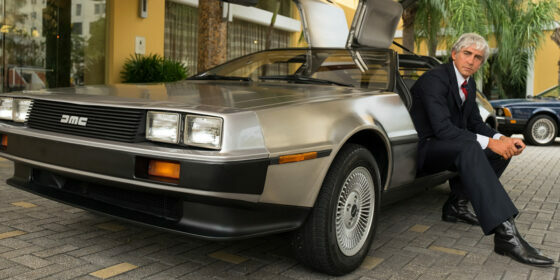 Driven announces itself as a biopic of John DeLorean, but we don’t learn much about the auto exec and innovator in the film; instead, director Nick Hamm and screenwriter Colin Bateman focus on the 1982 FBI investigation into DeLorean’s possible drug trafficking. The real protagonist of the film is DeLorean’s friend and neighbour, FBI informant James Hoffman, a charming but hapless con man played with deer-in-the-headlights bewilderment by Jason Sudeikis. The two meet when DeLorean saunters over to Hoffman’s house (in a pair of white tennis shorts that immediately steal the scene, not to mention the movie), and fixes Hoffman’s Pontiac GTO, smugly revealing that this iconic muscle car was his design. With puppy-dog devotion, Hoffman haunts DeLorean’s home, until he ultimately helps the FBI nab him in a sting operation. Unike the DeLorean itself, Driven is wholly generic. Every move in the film is predictable, and the humour, while sometimes on point, is by the book: let’s say, quipping one of the better lines from the movie, that it’s inherently chinless. The film does deal in classic American types—the self-made man, the huckster, corrupt authority—but it does so without much insight. Unlike the vintage furniture and dazzling sartorial choices of the cheerful mise en scène, the plot lumbers along to an unsurprising ending: the FBI is thwarted, brotherhood reigns, and finally we see the splendid silver DeLorean we’ve all been waiting for (and I don’t mean Lee Pace, who plays the role as well as anyone could). In the end, Driven’s message is disappointing: it’s perfectly acceptable to screw over your friends to save your family, and then screw over your boss to save your friends, as all will be not only forgiven but even rewarded. The film is politically cynical, especially compared to Hamm’s 2016 The Journey, which offered a cautious optimism and authentic dialogue. It seems a lot has changed in two years, especially when one considers that a journey implies going somewhere whereas Driven is a passive construction: Who exactly is driving whom? Hoffman doesn’t need to have a conscience in the film because the real baddy is always already the government. Still, Hamm isn’t comfortable with making his protagonist a total snitch, and in the end Hoffman redeems himself by—like that classic American anti-hero Bartleby the Scrivener—preferring not to answer the questions he is asked. Given the current political climate, Driven is rather disheartening, sympathizing as it does with entitled millionaires and forgiving even the most callous acts of betrayal because there’s just something so charming about the guy who’s making suckers of us all.